There is almost always an influx of creative, high-energy minds at the beginning of the school year. However, it can be a challenge to keep students engaged and inspired once routine sets in and the days all seem to blend together. Looking to spark your student’s creativity while in a rut? We’ve got some suggestions! First, let's take a closer look at the parallel between children and their creativity levels. 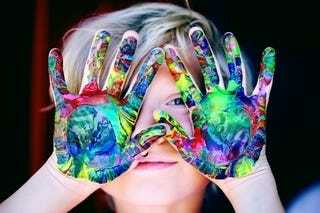 It’s been reported that kids’ creativity levels deplete as they age, which is saddening to hear as adults. How much creativity is lost as we age? Well, the answer may surprise you. A NASA study tested 1,600 students between ages four to five and found that 98 percent scored at the level of "creative genius." Five years later, only 30 percent of that same group of children scored at that level. After another five years? Only 12 percent. That's an 86 percent drop in ten years. 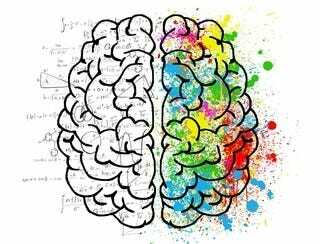 The test was also given to adults (averaged at 31 years old) and found that only two percent scored at creative genius level. Why does this matter? Without creativity, life is simply logical and bland; it’s similar to if there was no diversity or self-expression in the world. Keeping this concept simple, a world without creativity is a world without music, dance, visual art, literature, fashion or technological advances. Because of this, it’s important to recognize, appreciate and encourage young minds to be creative. Testing is definitely important, but shouldn’t be a heavy factor that determines a full grade or college acceptance. Testing limits creativity when focused on finding a single correct answer, when in reality, there could be multiple. This structure may carry into our own lives because as we grow older, we restrict our minds from exploring multiple possibilities and instead want to always do the right thing with little mistakes. Though, mistakes are not something to fear. In fact, something good may come out of messing up. The advancement in technology and the amount of time we are glued to phones is also a imagination buster. Kids today are exposed to cell phones and television screens early on, impacting their developing minds. Think about it this way: why would kids be motivated to imagine and create their own fantasy worlds when they have the ability to leisurely watch one that already exists on their mobile device? Same goes for video games; while kids technically have control when playing as an online character, they don’t have full creative control. They instead have a set of options to choose from (similar to multiple choice answers). Want to restore your kids’ creativity? Well, we have a few fun and practical ideas in mind for your child. And parents - these are perfect for integration at home, too! From the game concept, look and rules, a fun project for a classroom full of students is for each child or group to create their own board game. This can be a day long activity or a projects spread out in a few weeks. Either way, this inviting all kids to breathe life into an original object that can be enjoyed after its over! This suggestion is simple. Stock up on various art supplies and allow time for kids to create their own physical art masterpieces. This is especially great for certain schools who have cut art programs from their budget. Don't have the funds? No worries! This time can also involve dance, singing or writing; it's a free-for-all. As we've previously covered, a world without creative and personal expression is a world where everything is black and white. Though, there are few situations in life that are yes or no and right or wrong. For example, telling your kids not to talk to strangers is vital. However, exceptions do exist when those strangers are police officers or doctors. In this case, you're teaching them about the gray area. Encourage each student to keep a journal of their ideas, thoughts and feelings throughout the year. Ensure them that you, the teacher, will be the only one reading them and that everything is confidential. This idea is also great when trying to neutralize situations. When there is a conflict in class, instead of a “time out” or type of consequence from a set of actions, have the child record what they're feeling as a type of reflection. We found that Ms. Amanda Ferguson’s grant-winning lesson plan is incredibly creative as it gives children freedom to organize their own ways to raise money for charity. This is a win-win concept, as it allows students to be expressive and involved while giving back to the community. Any way you can get children to think outside of the box and let their mind wander is a great way to let them be creative. Though, not every individual is a creative one, and that's okay! Learn how to teach students with varied learning styles! Have your own creative ideas to share? 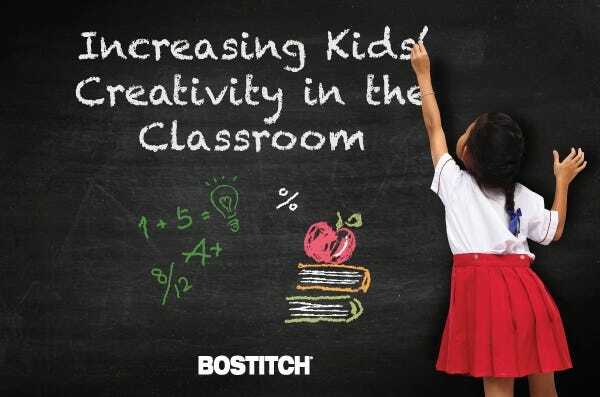 Enter the Bostitch Creativity in the Classroom Grant to submit your own original lesson plan for a chance to win a $250 grant!